SINGAPORE prime CBD Grade A office rentals are heading into their third year of increases on the back of steady demand amid tightening completion of new office space. Property consultants are generally still painting a picture of clear skies, with the familiar set of demand drivers - coworking operators and other flexible office space providers, and tech companies - expected to lead the way. Some are also hopeful of more office demand from financial institutions. However, interest rate hikes, trade wars, geopolitical tensions leading to slowdowns in the global and Singapore economies, are among the factors that could potentially dampen office demand on the island. Savills Singapore research head Alan Cheong, while sticking to his forecast that CBD Grade A rents will appreciate a further 8 to 10 per cent next year (after rising 10 per cent this year), cautions that office demand will not be free of headwinds. He argues that if the recent sharp correction in global equity markets - often seen as a leading indicator of companies' profitability - is not reversed, this "could result in key decision-makers in companies becoming more wary about expanding their real estate space requirements". Some observers may think a worsening business climate could result in increased demand for co-working space as corporates seek to boost efficiency - but this may not be enough to offset the potential effect of the cash-burn model on co-working operators, said Mr Cheong. "Co-working operators' ability to continually raise funding is key to maintaining or expanding their real estate footprint. What if their investors/VCs decide they no longer wish to fund the venture because prospects of getting a listing on Nasdaq have dimmed somewhat? The same could apply to other companies in disruptive industries that are similarly operating on cash-burn models. This is a major risk point on Singapore office demand in the next 12 months to me, but not one shared by most analysts," Mr Cheong added. "That said, for 2019, the saving grace for the Singapore office market will come from the dearth of office supply completion in the CBD." 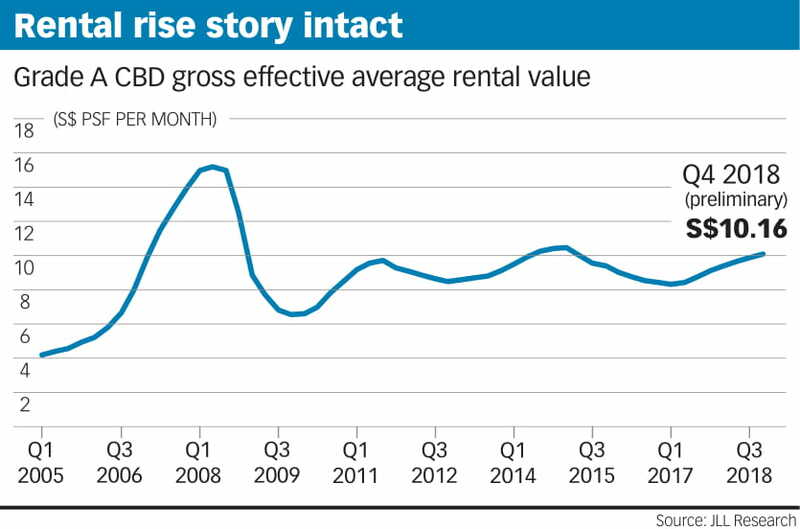 Based on the respective Grade A CBD office baskets of property consultants, average rental values have risen at a faster clip this year compared with last year - thanks to strong demand for office space in new buildings. As well, rents in older buildings in the CBD have been supported by co-working operators soaking up the space left by corporates that had relocated to the new buildings. The unanimous view among property consultants is that rent rises will continue in 2019, although most expect the pace of increase to be slower. JLL's preliminary estimates show that the average monthly gross rental value of Grade A office space in the CBD has ended the year at around S$10.16 per square foot, reflecting a 2.3 per cent quarter-on-quarter appreciation from the S$9.93 psf in Q3 2018. This translates to a full-year increase of 10.8 per cent from the S$9.17 psf in Q4 2017 - a faster clip than the 7.6 per cent rise in 2017. All in, rentals have recovered a total of 20.8 per cent from the recent bottom of S$8.41 psf in Q1 2017. JLL Singapore's head of research and consultancy, Tay Huey Ying, said: "The dearth of new Grade A CBD supply in 2019 coupled with the withdrawal of Chevron House for refurbishment will further tighten supply and pressure up rents next year. "However, the availability of new supply outside the CBD should help to relieve some pressure and cap CBD Grade A rental growth for 2019 at below the 10.8 per cent estimated for 2018." The office component of PLQ in Paya Lebar received Temporary Occupation Permit in two stages, August and October this year and still has about 30 per cent of its 872,000 sq ft net lettable office space available for lease. The Funan and Park Mall redevelopments are slated for completion next year. In similar vein, CBRE's head of research for Singapore and South-east Asia, Desmond Sim, said: "Office rents are projected to maintain an upward trajectory over the next two to three years, albeit at a more measured pace compared with the early part of the rental recovery cycle." He predicts a 9.3 per cent rise in CBRE's average monthly Grade A Core CBD rental value next year to S$11.80 psf, following the 14.9 per cent hike this year. Last year, the increase was 3.3 per cent. This pattern is mirrored in Colliers International's CBD Grade A office rents. The firm's head of research for Singapore, Tricia Song, is forecasting an 8 to 10 per cent rise for 2019, following hikes of 14.8 per cent this year and 2.3 per cent last year. Based on Urban Redevelopment Authority's data, the islandwide net office demand, measured by the change in occupied space, in the first nine months of this year amounted to 1.43 million sq ft, slightly more than twice the 645,835 sq ft for the whole of 2017. This was partly due to big tenants moving into the Marina One development and UIC Building; both were completed last year. Continued expansion by coworking operators has also helped with the strong net absorption this year. Colliers' Ms Song estimates the full-year 2018 islandwide net office demand at about 1.6 million sq ft.
For next year, she expects the figure to ease to about 900,000 sq ft - amid a slowdown in office completions to about 600,000 sq ft, from 1.8 million sq ft in 2018 and 2.7 million sq ft in 2017. URA's islandwide office vacancy rate has eased to 12 per cent as at end-September 2018 from the recent high of 13.3 per cent in Q3 2017. Ms Tay of JLL expects demand for Grade A CBD offices to remain broad-based in 2019, with flexible space operators remaining keen to expand their real estate footprint to grow market share. Cushman and Wakefield's senior director of research, Christine Li, is hopeful that leasing demand from tech companies may increase next year, noting among other things that companies in the ride-hailing segment are seeking to expand their presence in Singapore. JLL Singapore's head of leasing, Chris Archibold, too expects the tech sector to continue to drive demand across office and business park space in 2019 . Agreeing, Colliers' head of office services, Duncan White, said: "The government's continued push for tech, innovation and R&D, and varied sectorial growth will help to feed the growth in the market." Pointing to another potential office demand driver, Cushman & Wakefield's Ms Li said: "Constant rate hikes by the US Fed has improved the profit margins of financial firms, which is likely to lead to increased demand for space". CBRE's Mr Sim notes that should the US-China trade tensions deteriorate, that could have an overall negative impact on businesses' expansion and investment plans. The silver lining from this could be if some manufacturers shift production to South-east Asia. "Singapore could benefit indirectly if their (regional) head offices are set up here," said Mr Sim. Property consultants also highlighted that Singapore premium office rents are competitive. Said Mr Archibold of JLL : "According to our 'Premium Office Rent Tracker', Singapore sits as far down as 13th in the list of global cities from a cost perspective. Therefore current office rents should not be an impediment to demand. "The key is always business expansion and the business environment that Singapore provides for the expanding industries to encourage them to grow here." Among the trends in the office leasing market which consultants envisage is a move towards greater flexibility in lease structures and terms accorded by landlords to accommodate tenants' growth and fluctuating space needs. Colliers' Mr White expects to see more activity within the "Flex and Core" leasing model, which combines traditional office leases with short-term lease tenures in flexible workspace centres. Ms Tay of JLL predicts that the combination of rising rents and tight supply for Grade A office space in the CBD may drive more companies to explore the option of maintaining a smaller city presence and locate the rest of the business operations outside the CBD. "This should bode well for the government's decentralisation strategy."